Big Blue Breakdown: What is the Deal on Jerrel Jernigan? LB Jon Beason Placed on PUP List: As expected, New York Giants linebacker Jon Beason was officially placed on the preseason Physically-Unable-to-Perform (PUP) List. Beason suffered a ligament tear and small fracture to the sesamoid bone in his right foot during an OTA practice on June 12. The injury did not require surgery. The good news is that RB David Wilson (neck), WR Mario Manningham (knee), LT Will Beatty (knee), and OG John Jerry (knee) were not placed on the PUP. Wilson, as BBI reported earlier, has been cleared by doctors to resume football contact. Wilson underwent surgery on January 16 to fuse vertebrae to repair a herniated disc in his neck. He participated in non-contact drills this spring, but was not allowed to practice when contact was possible. Coughlin indicated that Manningham, Beatty, and Jerry will be limited in training camp practices. Sullen was originally signed as an undrafted rookie free agent by the Cincinnati Bengals after the 2013 NFL Draft. He was waived by the Bengals in August and did not play last season. Sullen has very good size and strength, but lacks ideal overall athleticism. 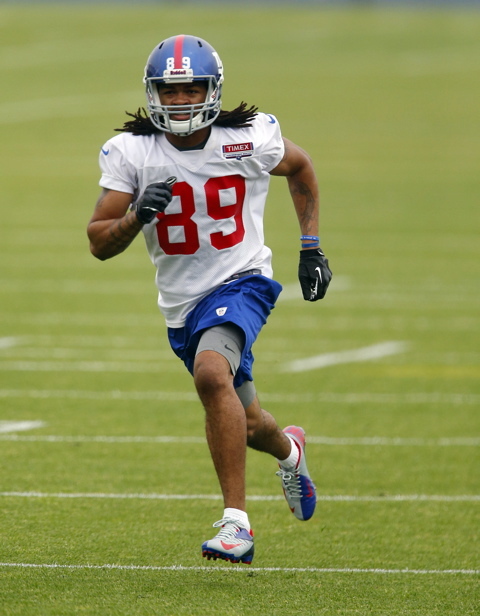 WR Kris Adams Waived: The Giants waived WR Kris Adams after he failed his physical. 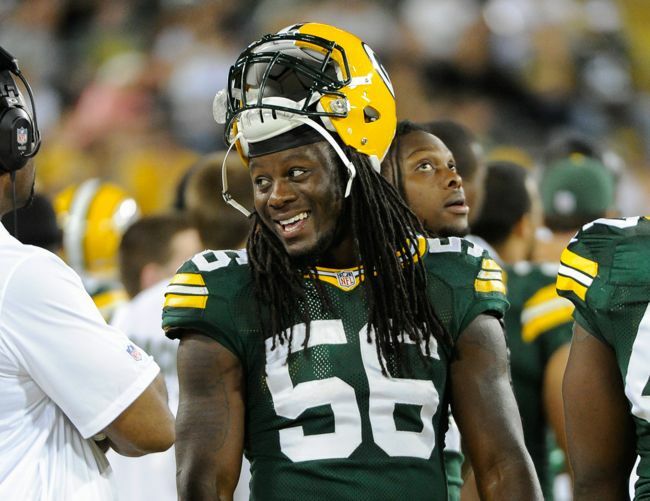 Adams was placed on Injured Reserve in August 2013 with a broken left ankle he suffered in a preseason game. New York Giants Sign LB Terrell Manning: The New York Giants have signed street free agent linebacker Terrell Manning. Terrell Manning was signed as a street free agent by the Giants in June 2014. Manning was originally drafted by the Green Bay Packers in the 5th round of the 2012 NFL Draft. Since then, he has spent time with the Packers (2012-13), Chargers (2013), and Vikings (2014). The Vikings waived him in May 2014. Manning has played in six NFL games with no starts. He has three career tackles. Manning has decent but not ideal overall athleticism and size. Lacks speed. He’s an instinctive, aggressive physical player against the run. Good hitter and tackler. However, Manning needs to improve in pass coverage. He has been slowed by illness/injuries (parasite/colitis, shoulder, concussion). Manning grew up idolizing Lawrence Taylor. New York Giants Sign DT Jay Bromley: The New York Giants have finally signed the last of their 2014 NFL Draft picks: 3rd rounder defensive tackle Jay Bromley (Syracuse). Bromley was signed to a 4-year deal. The Giants other six draft picks signed last month. New York Giants Place WR Kris Adams on the PUP: According to the NFL transactions wire, the New York Giants placed WR Kris Adams on the Physically-Unable-to-Perform (PUP) List last Friday, a day after they had waived him. The Giants had signed Adams in January 2013 after he had spent some time with the Chicago Bears, St. Louis Rams, Minnesota Vikings, and Indianapolis Colts. However, Adams broke his left ankle during the 2013 preseason and missed the entire season on Injured Reserve. New York Giants 3-Day Mini-Camp Begins Tuesday: The New York Giants mandatory, 3-Day mini-camp begins Tuesday and will run through Thursday. The mini-camp will culminate the Giants offseason program. The players will be off until they are scheduled to report on July 21 at Quest Diagnostic Center in East Rutherford, New Jersey. Like the recently-completed Organized Team Activity (OTA) practices, there is no live contact during mini-camp, but 7-on-7, 9-on-7, and 11-on-11 drills are permitted. Unlike the OTAs, two-a-day practices are permitted on two of the three days of mini-camp. Jon Beason Has Broken Bone, Torn Ligament in Foot: The New York Giants announced on Friday that middle linebacker Jon Beason suffered a ligament tear and a small fracture to the sesamoid bone in his right foot during Thursday’s Organized Team Activity (OTA) practice. 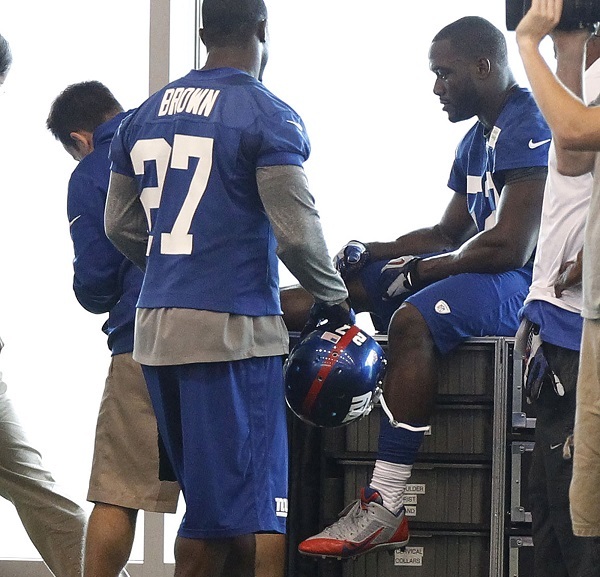 While Beason remains hopeful he will return early in the 2014 regular season, the Giants did not announce any projected timetable for his return. And since Beason will undergo further evaluation by specialists on Monday, the treatment options, including possible surgery, have not yet been decided upon. Unidentified team sources have told the media that surgery is likely and that Beason may be out three months. 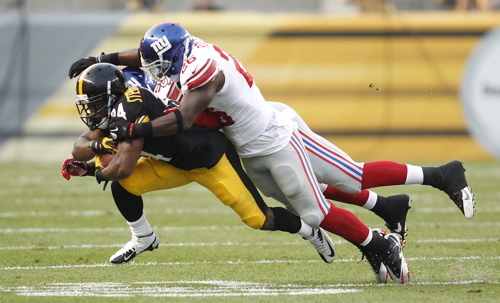 NYG LB Jon Beason has sesamoid fracture in right foot. Surgery required. Expected 12 week recovery, according to someone aware of diagnosis. Beason was hurt defending a pass play during practice. “It’s just one of those things – you have freak injuries,” Beason said. “I was just changing directions. I would say that the movement was a little unorthodox, I was flexing with the big toe in the ground and then I pivoted on it all the way around. It’s a movement that I often do that allows me to come in and out of my breaks faster. I literally felt like I stepped in like a sprinkler head hole. I just felt it give right away, so the next step I knew I couldn’t put the foot down. “I had a bad feeling. I really felt that I that I had torn the extensor, which is the tendon with the muscle, it’s how your big toe functions. That would have been season-ending. So at least now there’s a procedure, possibly. We haven’t decided if it’s something that’s invasive or something that you just kind of let heal on its own. The timeframe is about the same, but it’s not season-ending, so I’m happy about that. The specialist who Beason will see on Monday is someone who Beason has a relationship with. He operated on Beason’s ruptured left Achilles tendon in 2011. Beason also had microfracture surgery after the 2012 NFL season. “He knows my body,” Beason said. “I think the world of him. I was impartial to doing it here with (the Giants doctor), but I think they wanted to make me feel comfortable to go down there and get a second opinion. He wants to do some more tests to determine what he thinks is best and then those two will sit down and figure out the best plan for me. New York Giants Waive WR Kris Adams: According to the NFL transactions wire, the New York Giants have waived WR Kris Adams. The Giants had signed Adams in January 2013 after he had spent some time with the Chicago Bears, St. Louis Rams, Minnesota Vikings, and Indianapolis Colts. However, Adams broke his left ankle during the 2013 preseason and missed the entire season on Injured Reserve. Because of this move, we have updated the Transactions, Roster, and Depth Chart sections of the website. August 12, 2013 New York Giants Training Camp Reports: The Giants held their 12th training camp practice on Monday afternoon at the Quest Diagnostics Training Center. The next practice is on Tuesday from 1:30-3:45PM. For a complete training camp schedule and Giants.com Q&A guide, see the Training Camp section of the website. Injury Update – Antrel Rolle Carted Off Field With Ankle Injury: Not practicing on Monday were WR Jerrel Jernigan (soreness), WR Brandon Collins (hamstring), OL James Brewer (concussion), OT Chris DeGeare (ankle), DE Damontre Moore (shoulder), CB Corey Webster (soreness), S Cooper Taylor (hamstring), FB Henry Hynoski (PUP – knee), DE Jason Pierre-Paul (PUP – back), and DT Markus Kuhn (PUP – knee). Antrel Rolle was carted off the field after injuring his right ankle. Rolle will be undergoing an MRI in order to determine the severity of the injury. According to multiple press reports, the initial diagnosis is a sprain, but there is no word on whether the sprain is the more serious high-ankle variety, which can take some time to recover from. DE Justin Tuck (back), OL Justin Pugh (concussion), and RB Ryan Torain (concussion) returned to practice. Roster Moves: The Giants waived/injured WR Kris Adams (broken ankle) on Monday. To fill his roster spot, the Giants signed WR Marcus Harris. Sights and Sounds from Giants-Steelers Preseason Game: A sights and sounds video from the Giants-Steelers preseason game is available at Giants.com. August 11, 2013 Tom Coughlin Press Conference: The transcript of Head Coach Tom Coughlin’s Sunday media conference call is available at Giants.com. August 11, 2013 New York Giants Injury Report: WR Kris Adams fractured his left ankle in the game against the Pittsburgh Steelers on Saturday. He underwent surgery on Sunday and is obviously out for the season. OT Chris DeGeare injured his knee and ankle and there is no word yet on the severity of the injuries. Head Coach Tom Coughlin believes DE Justin Tuck (back) and OT Justin Pugh (concussion) will return to the practice field soon, possibly on Monday. Giants.com Q&A With Deon Grant: The video of a Giants.com interview with former Giants’ safety Deon Grant is available at Giants.com. In Part I, we covered the three New York Giants wide receivers who are likely to make the team behind stalwarts Hakeem Nicks and Victor Cruz, namely Rueben Randle, Jerrel Jernigan, and Louis Murphy. Now we’ll turn our focus to the remaining five challengers: Ramses Barden, Brandon Collins, Kevin Hardy, Kris Adams, and Jeremy Horne. It is not set in stone how many wide receivers the New York Giants will carry on the 53-man roster. But the team usually keeps six. That might be harder to do this year if the Giants keep three quarterbacks. Nevertheless, for now, let’s assume the Giants keep six. That means barring injury or something unforeseen, Barden, Collins, Hardy, Adams, and Horne will be fighting for one roster spot. It’s easy to dismiss the relevance of the sixth receiver. But just keep in mind that Victor Cruz was once considered “camp fodder” too. Drafted in 3rd round of the 2009 NFL Draft, Ramses Barden has been a disappointment. In four seasons, Barden has only had 29 receptions for 394 yards and no touchdowns. His best game as a pro came in Week 3 of the 2012 season, when he started against the Panthers and caught nine passes for 138 yards. But he only had five catches the rest of the season. So why was Barden re-signed by the Giants? For one, you need bodies in camp to throw to, and the Giants usually carry at least 10 wide receivers heading into camp. Secondly, Barden knows the offense. If someone gets hurt and can’t play, it’s easier for him to come in and contribute more quickly because of that. Third, Barden does have some talent. He is a huge receiver (6-6, 224lbs) with long arms and decent athleticism. He has flashed as a player on the practice field and in regular-season games. But for some reason, Barden simply hasn’t been able to be consistent contributor once the games count. He’s only been on the active regular-season roster 29 times in 64 chances. Some of that is due to injuries, but Barden also has never stood out as a special teams performer. It’s very tough to activate your fifth or sixth receiver on game day if he doesn’t contribute on special teams. In addition, as a receiver, Barden lacks ideal speed and quickness, and appears to have difficulty separating from tight, aggressive coverage, especially off of the line of scrimmage. Most importantly, with the exception of Week 3 in 2012, Barden simply has not consistently delivered on the playing field. Barden will have to fight to make the 2013 team. He has a decent chance to make it if none of the other wide receivers impress because, again, he knows the system and therefore would be a good insurance policy if someone gets hurt. Even if he makes it, however, unless he dramatically improves or someone gets hurt, he’ll likely be inactive for most games once again. Brandon Collins lacks ideal size (5-11, 180lbs) but he has very good speed (4.4) and quickness. Collins also has collegiate experience returning punts. Raised expectations fizzled out shortly thereafter as Collins did not have a catch in the first three preseason games and was waived before the last preseason contest. He spent some time on the Giants’ Practice Squad in September but was not with the team for most of the season. Nevertheless, it appears that the Giants saw enough in Collins to bring him back for one more go-around as they re-signed him in January. Kevin Hardy was originally signed by the New Orleans Saints as an undrafted rookie free agent after the 2012 NFL Draft. The Saints waived him in August 2012. The Giants signed him in January 2013. Hardy has ordinary size (6-0, 182lbs), but he has very good speed (4.4 range) and leaping ability (37 inch vertical). He also has collegiate experience as a kickoff returner. Hardy is very raw, having played in a college offense at the Citadel that only threw the ball 75 times his senior season. Hardy only had four catches for 53 yards and one touchdown in 2011. Kris Adams was originally signed by the Chicago Bears and an undrafted rookie free agent after the 2011 NFL Draft. He did not make the team but spent time on the Practice Squads of the Bears, Rams, and Vikings in 2011. The Colts signed him in June 2012. Adams impressed in offseason workouts and caught five passes for 90 yards for Indianapolis in the preseason. He made the team and caught two passes for 26 yards in September, but the Colts then moved Adams to the Practice Squad in October. The Giants signed Adams in January 2013. Adams has a nice combination of size (6-3, 194lbs) and athletic ability (4.4-range in the 40, 39.5 vertical jump, 6.97 3-cone), but he needs a lot of technique work, especially with his route running. Nevertheless, Adams has demonstrated an ability to threaten defenses down the field with his speed. Although he is capable of the circus catch, he needs to become more consistent catching the football. Adams has not stood on on special teams at the pro level. 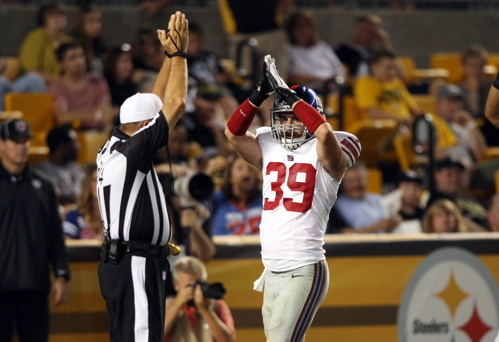 The Giants signed Jeremy Horne in May 2013 after he impressed at the rookie mini-camp as tryout player. Indeed, Horne convinced the Giants to waive very talented undrafted rookie free agent WR Marcus Davis out of Virginia Tech, deciding to swallow the $15,000 signing bonus they gave Davis. Horne played at the University of Massachusetts with Victor Cruz and was considered by some to be the better NFL prospect. Horne was originally signed as an undrafted rookie free agent by the Kansas City Chiefs after the 2010 NFL Draft. Horne spent time on both the Chiefs’ practice squad and 53-man roster until he was finally released in August 2012. He has only played in 12 games with no catches. Horne has good size (6-2, 193lbs) and athletic ability (4.4 speed). He also has experience returning kickoffs. “This guy’s a young player that has a certain skill set that is unique at times,” said former Chiefs’ Head Coach Todd Haley. On the surface, these five do not look like an overly impressive group. One gets the strong impression that Barden only came back to the Giants when the other 31 teams in the NFL expressed little interest. Collins was waived by the Giants last year and Hardy, Adams, and Horne have been waived by other teams. Yet the Giants have seen enough in each to at least give all five a legitimate shot at a spot on the 53-man roster. And they liked these five over any other available undrafted rookies. Will any one of these five players make a strong impression at training camp and the preseason? Special teams play could be the determining factor.